2/3 cup (160 ml) unsulphured molasses(To prevent molasses from sticking to the measuring cup, first spray the cup with a non stick vegetable spray. Bake for about 8 -12 minutesdepending on the size of the cookies. They are done when they are firm and the edges are just beginning to brown. Remove the cookies from the oven and cool on the baking sheet for about 1 minute, then transfer to a wire rack to cool completely. If desired, you can press raisins, currants, or candies into the dough for eyes and buttons while the cookies are still warm. Otherwise, confectioners frosting can be used to decorate the cookies. Store in an airtight container. Confectioners Frosting: In an electric mixer (or with a hand mixer), beat the butter until smooth and well blended. Add the vanilla extract. With the mixer on low speed, gradually beat in the sugar.Scrape down the sides of the bowl and beater. Add the milk and beat on high speed until frosting is light and fluffy (about 3-4 minutes). Add a little more milk if needed. 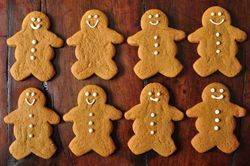 Tint frosting with food color, if desired.Place the frosting in a pastry bag fitted with a decorative tip and decorate the gingerbread men as desired.